We’ve had a bit of a hiatus lately as I prepared to move away from the east coast (boo!). While I am terribly sad that I am no longer within driving distance of Amanda, I sure am happy we took advantage of the lessened distance for those few months. Now, the distance dishes title seems more appropriate than ever as it is the perfect way to keep in touch between our (hopefully) semi-annual run-cations. *The measurements/ratios of the glaze are fairly fluid and can be tuned to your palette. I prefer a spicier glaze so I may add a bit more sriracha. Usually I just eyeball this mixture. Mix together the ingredients for the Sweet Chili Glaze in a small bowl and set aside as you prepare the pork chops. Blend together ginger, garlic, salt and pepper together and rub the chops in the spice blend with even coverage. Don’t be shy about it. Using a skillet or oven safe pan, brown the pork chops cooking about 5 minutes on each side. Once the chops are nicely browned, I like to brush a bit of the glaze on eat chop before transferring to the oven, however you can save it all for the end if you’d like. regardless, transfer the pan to the oven and continue to cook the chops in the oven for 10-15 minutes until the internal temperature of each chop reaches 140 degrees. Brush the entirety of the glaze onto the pork chops dividing between the four of them, cover in foil and allow to rest for 5-10 minutes before eating. Enjoy! Wine Pairing: To pair with the deliciousness and complex flavors of the sweet chili sauce, I coupled this dish with a Casillero del Diablo Devils Collection white wine blend that had notes of pineapple and citrus to match with the tart notes of the sweet chili. I think this was my favorite pairing so far, so if you happen to see this wine in the store, I highly recommend these two together. Breakfast is my favorite meal! Add some mimosas and some good friends, and brunch is the highlight of any day. Merideth and I made this on our beach weekend, and I served it again for a rainy Netflix marathon when Hurricane Hermine pushed us inside on Labor Day Weekend. Both times, this was a hit! Quick prep means that you can get the casserole in the oven and, if you’re like us, push play on your Saturday morning cartoons! This recipe uses peanut butter, banana, and chocolate chips, but could allow for other combinations as long as the milk/egg mixture is maintained. Next time, I’m thinking blueberries, or maybe some seasonal pumpkin spice! 1/4-1/2 cup milk of your choice (I have used almond and traditional milk, both good!). Depending on how large the loaf is, you may need additional milk/egg mixture to saturate the bread. Preheat oven to 350 degrees, and grease 9×13 pan. 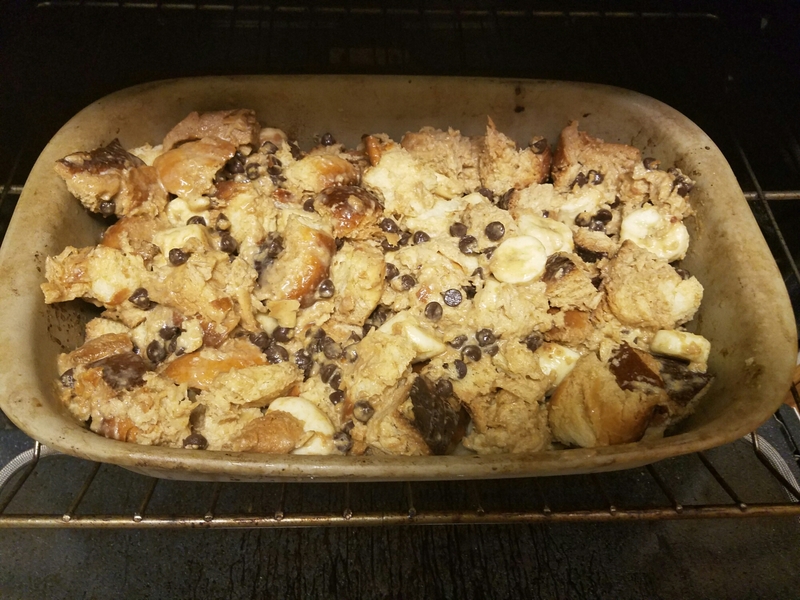 Combine chocolate chips, bananas, and bread. Don’t worry if the chocolate chips settle on the bottom! Blend milk, peanut butter, eggs, and cinnamon until smooth. I recommend using a blender, but a whisk can work if one is unavailable. Pour egg and milk into bread, and fold until well coated. Bake all ingredients in 9×13 pan for approximately 35 minutes, and serve with powdered sugar or syrup, if desired.